Hey hey…..good lookin. Whatcha got cookin? This recipe on Pinterest caught my eye from Big Oven and I couldn’t resist. I think I pinned it months ago and tonight I finally got around to making it. Garlic Parmesan Crusted Pork Chops. Super yum. Super duper yum and delightful to the nostrils. Notice there are several things crossed out. I don’t typically add the extras on recipes unless I have it….and I know herbs can add some real flavor, but they just aren’t something I keep around. I have basil and parsley, and that’s about it! I’m definitely not squeezing lemon wedges over top and garnishing with parsley sprigs. This isn’t the Palomino…it’s my little country kitchen. 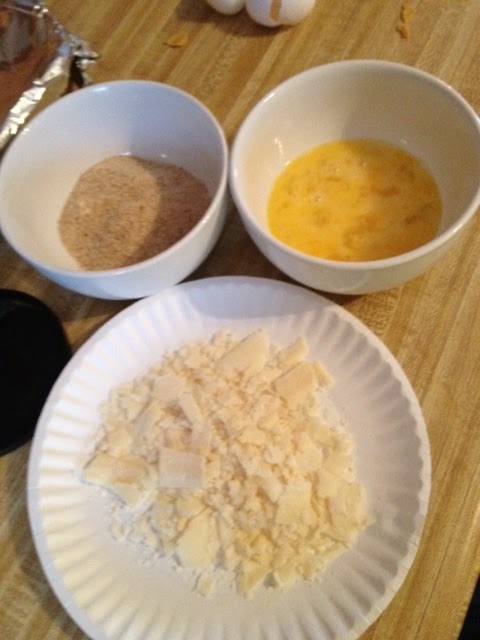 Spread Parmesan cheese out (see paper plate). Beat eggs with one tablespoon vegetable oil in another bowl. (p.s. – I forgot the vegetable oil and still turned out okay.) Spread bread crumbs in another bowl. Next time I plan to buy grated Parmesan instead of freshly shaved. My counter which is dirty and iPad ready on the Big Oven app. Pat the pork chops dry with paper towels. Combine salt and pepper (and sage and thyme if ya want to) and sprinkle generously over both sides of the chops, pressing seasonings into meat with your fingers. This doesn’t gross me out, hopefully not you either. Bread pork chops one at a time. 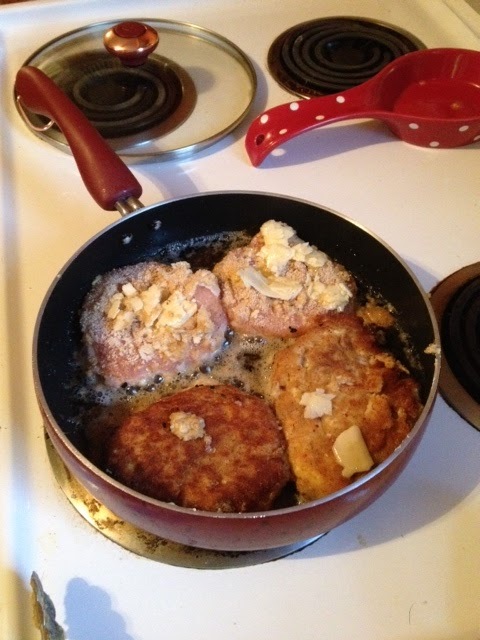 Dredge seasoned chops in Parmesan cheese, coating both sides completely, patting to adhere. Then, using tongs, carefully dip both sides of chops in egg mixture, letting excess drip back into dish to ensure thin coating. Finally, dip both sides of chops in bread crumbs, pressing crumbs with fingers to form an even, cohesive coating. This gets really messy….that’s why there ain’t many pictures. 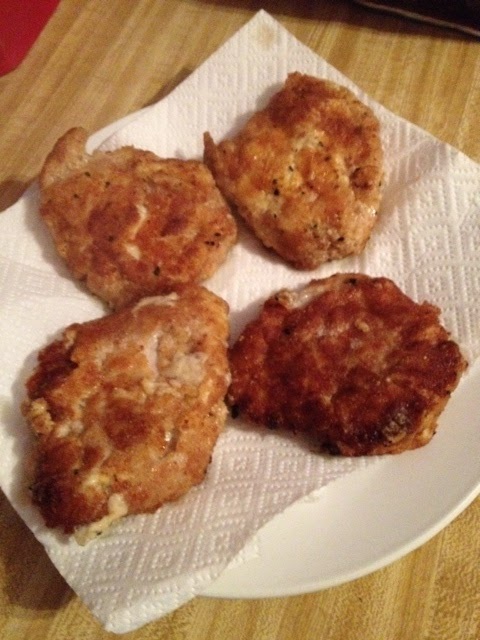 Place breaded chops on a wire rack set over a baking sheet if you’re a neat freak and super woman in the kitchen which allows coating to dry for about 5 minutes. Or if you are me then throw them suckers straight in the frying pan that’s ready. Get your frying pan ready with some olive oil. Toss in some real garlic (or minced garlic if you’re me) and let it get hot. Remove the garlic best you can if you want. I left it in….but I like garlic a LOT. 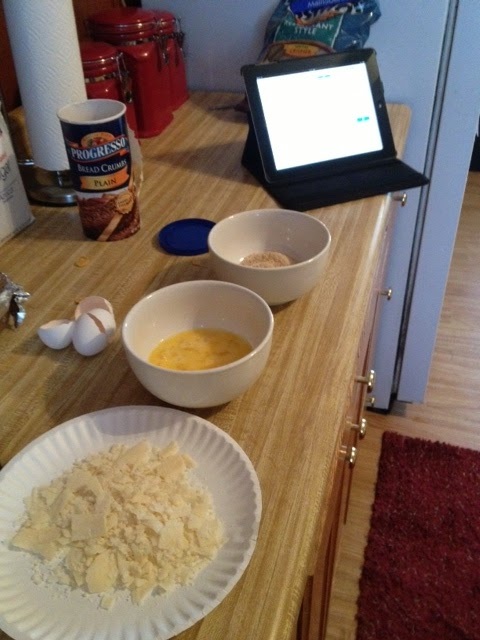 All the breading part can be done ahead of time….if you can think ahead of time. I typically don’t when it comes to cooking. If you do make sure to cover the chops loosely with wax paper and refrigerate for up to one hour or so. The recipe calls for heating a large heavy-bottomed skillet over medium-low heat. We have the pots and pans we were given for Christmas last year. Nothing fancy. Paula Deen style actually. They work. The two on top haven’t been flipped. The two on bottom have. I like my stuff crispy and sometimes even “burnt” but I’m weird like that. 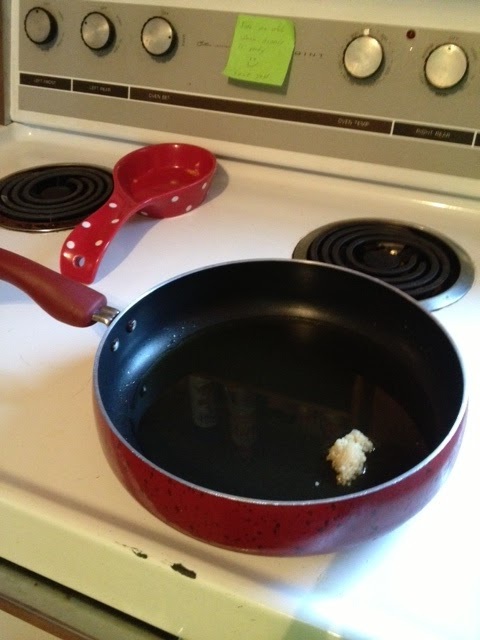 When oil shimmers, add chops and fry 4 to 5 minutes on each side, until golden brown and crispy, or to an internal temperature between 150 and 160 degrees. Drain on rack set over baking sheet (or if you’re me then drain them on paper towel on a paper plate). Please don’t judge my fine china. Then it tells you to transfer to a warm serving platter and garnish with parsley sprigs and serve with lemon wedges. I’m sure that adds some “presentation” and maybe even some flavor, but I tossed my man’s chop on a plate with the sides and he was more than happy to try this new recipe. I used the fine china for the main presentation. Please be aware that I’m aware that my pictures are less than amazing. I shot it all with the iPhone 4S and I am not about to make my food like any more amazing than it already is because I then I would have all you freaks knocking on my door tomorrow evening for dinner. And quite frankly, without a dishwasher or a garbage disposal I just can’t cook for more than 2 people. Ask the man of this house. Our deal is I cook and he does the dishes. Now tonight I let him get buy because he’s working ground for the neighbors. He snuck in to use a real plate before heading back out to sit in his big green tractor for the night. P.S. Either don’t look at the nutritional information if you’re dieting OR cut the chop in half like I did. Corn bread should probably be eliminated too. 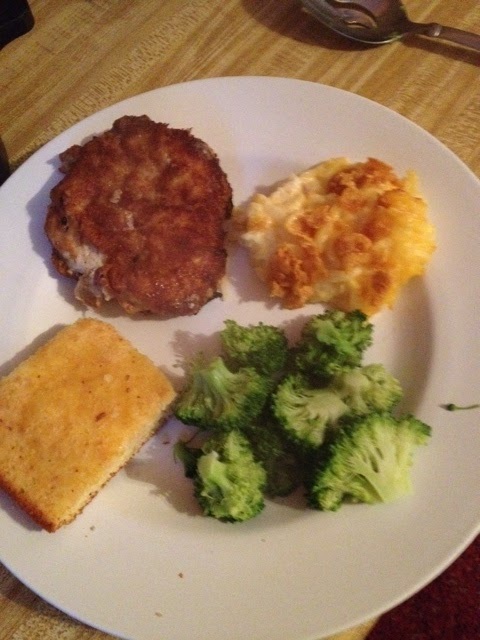 Oh hell…so should the hash brown casserole. Just remember…small portions. Your men can thank me later.